(Nanowerk Spotlight) Blood diagnostic technologies have come a long way. In old movies, saying "the rabbit died," was a popular way for a woman to reveal she was pregnant. The belief was that the doctor would inject the woman's urine into a rabbit. If the rabbit died, she was pregnant. The rabbit test actually originated with the discovery that the urine of a pregnant woman – which contains the hormone Human chorionic gonadotropin (hCG) – would cause corpora hemorrhagica in the ovaries of the rabbit. These swollen masses on the ovaries could only be detected by killing the rabbit in order to exam its ovaries. So, in reality, every rabbit died whether the woman was pregnant or not. Fortunately (for rabbits in particular), immunoassays – which can detect hormones, antibodies and antigens in the blood – were developed in the 1950s. Radioimmunoassays were first used to detect insulin in blood, but were later used for a variety of diagnostic tests. The technique is extremely sensitive and specific, but the necessary radioactive substances make it risky and expensive. In the 1960s, immunoassay technology was greatly enhanced by replacing radioisotopes with enzymes for color generation, which eliminated the risk and a great deal of expense. Today, most immunoassays are Enzyme-Linked ImmunoSorbent Assays, or ELISAs. Although there are numerous variations of ELISA, the test basically involves an antigen attached to a solid surface. When the antibody is washed over the surface, it will bind to the antigen. The antibody is then linked to an enzyme – usually a peroxidase (enzyme that causes oxidation) – which reacts with certain substrates, resulting in a change in color that serves a signal. Although traditional immunoassays such as ELISAs have become widely used and reliable diagnostic tools, they are time-consuming and labor-intensive procedures – requiring sample purification/separation, incubation, and rinsing steps prior to analysis. Research to develop sensors that can rapidly detect biomarkers (associated with certain diseases such as cancer) in whole blood, ideally at the point of care, and when the protein biomarker level in blood is very low (i.e. the disease is in an early stage) is being advanced by nanosensor technology. In a recent development, scientists in Spain have developed a rapid nanochannel-based immunoassay capable of the filtering and subsequent detection of proteins in whole blood without any sample preparation. "This is the first time that a simple assay to detect proteins in whole blood using nanochannels has been achieved," Arben Merkoçi, an ICREA Research Professor who leads the Nanobioelectronics & Biosensors Group at the Catalan Institute of Nanotechnology, tells Nanowerk. "Now, we have a simple device and set-up that allows nanochannels to achieve such the double functionality of filtering and detection on the same platform." Reporting their findings in the February 4, 2011 online edition of Small ("A Nanochannel/Nanoparticle-Based Filtering and Sensing Platform for Direct Detection of a Cancer Biomarker in Blood"), Merkoçi and postdoc researcher Alfredo de la Escosura-Muñiz describe a novel immunoassay platform based on nanochannel/nanopore blocking with gold nanoparticles. "Our nanochannel-based immunoassay is capable of filtering and subsequent detection of proteins in whole blood without any sample preparation," explains Merkoçi. "We accomplished this by using a nanoporous/nanochannel membrane modified with antibodies, the conductivity of which toward a redox indicator is tuned by primary and secondary immunoreactions with proteins and gold nanoparticles." One of the most important properties that the nanoporous platforms can offer to biosensing is the fact that they can act as filter agents of biomolecules with sizes larger than the pore diameter. The two scientists also found that the nanopore blockage by gold nanoparticles can be enhanced by silver deposition, thereby further decreasing the diffusion of the signaling indicator through the nanochannel. "In addition to the improvement in the sensitivity, the silver enhancement has the advantage, in comparison with the use of larger nanoparticles, that the resulting gold nanoparticles covered with a silver shell can perfectly fit the nanochannel diameter," says Merkoçi. "The blocking would be difficult to achieve with larger nanoparticles due to the nonuniformity in the size of the pores." To test the practical applicability of their platform the researchers applied it to the detection of the cancer biomarker CA15-3 spiked in blood samples (CA15-3 is a glycoprotein mainly used to study patients with breast cancer). They were able to demonstrate an efficient immunoassay capable of detecting 50 ng mL-1 and 52 U mL-1 quantities of immunoglobulin and CA15-3, respectively, in different media. 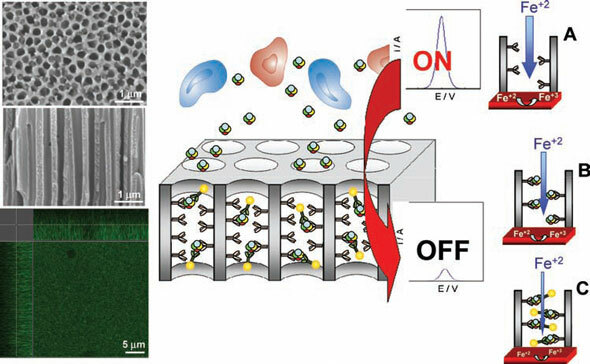 In conclusion, this rapid and low-cost sensing platform allows the direct detection of proteins in a relatively heavy matrix such as the whole blood without previous separation/filtering. Furthermore, as the researchers point out, this work can be extended not only to other proteins but also to DNA and cell sensing with interest for various fields – diagnostics, environmental control, safety and security. Going forward, the researchers are now exploring the integration of the nanoporous membrane with the transducer so as to achieve a highly integrated device with a view towards future technological developments and applications.